I stood there, staring into the fridge, seething with frustration over my poor food choices. Dinner started with the best of intentions as I reassured myself that I would eat just enough. But, I didn’t stop and now I wondered why I just can’t stop overeating. “I’ve ruined today so I may as well eat what I can now and start tomorrow” played like a broken record in my mind. But that spinning vinyl screeched to a halt “that day” when something crazy happened. Have you ever felt like there was no hope for you in your quest to end overeating? Yeah, me too. And there are a bunch of reasons why both you and I have struggled. In this post, I am going to break down the top ten of binge eating, overindulgence, and overeating causes. Unlocking the why will help you figure out your best next steps towards food freedom. Read through the list, noting any areas that stand out to you. Then be sure to download the checklist that will help you find your personalized solution! Do you know that the number one risk factor for obesity is dieting? Diets jack us up! Pull any two random diet books off a bookstore shelf and you are going to find two plans with rules that probably contradict one another… What’s a girl to do? At any given meal, it is pretty much guaranteed that you are eating something that some “expert” somewhere proclaims is terrible for you. And you know as well as I do what making food choices we perceive as “bad” does to us– Yep! We tend to eat more. To over-eat. This mindset is the very thing that makes you feel like you can’t stop overeating. WHAT TO DO: Survey your previous diet experience and determine if all-or-nothing thinking has plagued you. Then commit to setting aside fads and seek to gently change your eating (without drastic restrictions) for good. This one probably doesn’t surprise you as one of the major overeating causes. Women today are running a pace they can hardly keep up with. It seems the more conveniences our lives offer, the more packed with inefficiencies they become. Multitasking, micromanaging and having a mobile phone attached 24/7 have dramatically increased our stress levels. When this happens, finding a break with food is hard to pass up. Why food? Well, if you feel guilty for being “unproductive” for even a microsecond, eating is a great excuse to finally stop. WHAT TO DO: Give yourself permission to unplug without food. Have you noticed that nourishing food begets nourishing food just as processed, carby food makes you crave even more of IT? While you may have thought this all in your head, there is a physiological reason for this. Surprisingly, there are obese individuals in North America who are dying from malnutrition. I’m not kidding. While these men and women are eating (many) more calories than their bodies need, they are consuming very few nutrients. Packaged food filled with fake ingredients, stripped of all their natural nutrition do not satisfy our bodies the way whole, God-made food does. Meals lacking in protein, healthy fats, fiber, and the nutrients found in fruits and vegetables will leave us longing for more, even if we just ate! WHAT TO DO: Survey your plate and look for simple ways to balance your meal so that you can walk away fully satisfied. (even though you feel as though nothing works for you)? Get started today with this FREE Beat Overeating checklist! Let’s be honest, we like to be liked. And one way to try to paint ourselves in a favorable light with others is by saying “yes” to their requests, regardless of how many plates we are already trying to spin. Have you heard the saying “you can’t pour from an empty cup?” Well, you can’t expect a woman who runs from dusk to dawn managing kids, a home, and all those people-pleasing responsibilities to have much left in the tank to say “no” to those sugary sweets. Not respecting your need for rest, quiet, and relaxation can lead to making disrespectful choices towards your body. WHAT TO DO: Pull out your calendar and mark off one evening per week that you fully commit to leaving unscheduled. Dehydrated bodies do not run optimally. Headaches, a lack of energy and persistent hunger are all signs that you could use some H2O. If you are not familiar with the feelings of true body hunger then it will be very easy to misinterpret thirst as a need to eat. To make matters worse, if we start eating when not hungry (the start signal), it is difficult to know when we are full (the stop signal). And, we may end up too FULL. WHAT TO DO: Determine how much water you need each day and create a plan to build up to that total over the next 30-60 days. Have you ever eaten for entertainment? Let’s call this practice “eatertainment”. The day is boring. Maybe you’re weighed down with responsibilities or straight-up UNinspired by your life and eating feels like the perfect solution. On the flip side, think of the last time you were so involved in a project that you completely forgot to have a meal? You engaged your mind and knocked food way down your priority list. When our days start to run into one another, food can be a source of excitement. If your desk job is making you dreary, lunch may be a bright spot. If you’re cooped up in the house because of bad weather, eatertainment may be your best attempt to beat boredom. WHAT TO DO: If you feel like you can’t stop overeating, check and see if food is a major source of “fun” in your life. Then, look for something to do besides eating. It’s that moment when you are so tired you reach for something, anything, to eat that will give you a little boost of energy. Food is energy but food cannot replace rest. If you are mentally or physically overtired, it can be very difficult to stop overeating. WHAT TO DO: Aim to sleep 7-8 hours per night and embrace good sleep hygiene. Just like any healthy habit, give yourself time to create better sleep habits. From the time we were small we have been rewarded with food. A winning tee-ball game or an aced exam were all our parents needed to break out the ice cream! As we become adults, this habit can linger in our lives. And, it can become much more pervasive. If we are looking for an excuse to eat, just about any event can be a means for reward. For many, simply making it through the day feels like a reason to reward. For years I hung onto my nighttime snack, something I saw as a way a treat myself for getting from point A to point B. Food can be a nice treat but frequent rewards with it can hinder our goals. WHAT TO DO: Create a list of non-food rewards and PLAN on giving yourself a special treat once per week. Remember that this does not have to be fancy, a new bottle of nail polish from the Dollar Store or a Saturday morning walk with a friend count. Being a female isn’t always a walk in the park. Hormonal fluctuations can wreak havoc on our moods and cause unwanted cravings. While we cannot control how we feel, it is easy to overlook the fact that we can control how we react to those feelings. When we let our feelings run awry we can feel much more anxious, angry, and time-of-the-month moody than we have to feel. It’s often our emotion about the emotion that makes us most uncomfortable and seeking a reprieve in food. WHAT TO DO: Look for monthly patterns in your emotional state and plan accordingly– A walk instead of intense workout or just laying in bed. A hearty, healthy, homemade dinner instead of a salad or fast food raid. A relaxing evening at home instead of overscheduling or hiding away. You, my friend, are a triune being- having a spirit, a soul, and a body. When any one of those areas goes unkept, that disruption can overflow into our food choices. This is especially true for spiritual hunger. God created us to fellowship with Him and when that space in our lives is empty, we are empty indeed. Have you ever felt like something is missing but you just can’t put your finger on it? Chances are really good that you are spiritually undernourished and you need to give God control over your eating. WHAT TO DO: Set aside time each morning read these Bible verses about overeating. You can take them through my weight loss Bible study method. As you can see, there are lots of reasons why you can feel like you literally can’t stop overeating. To change, we need to become more aware of why we are doing so in the first place. Then we can create fitting solutions that will impact our lives. This is what has happened on my journey. When I didn’t know why I stood in front of the refrigerator longing to eat when I wasn’t hungry, it was hard to stop. And that broken spinning vinyl in my head finally came to a screeching halt. 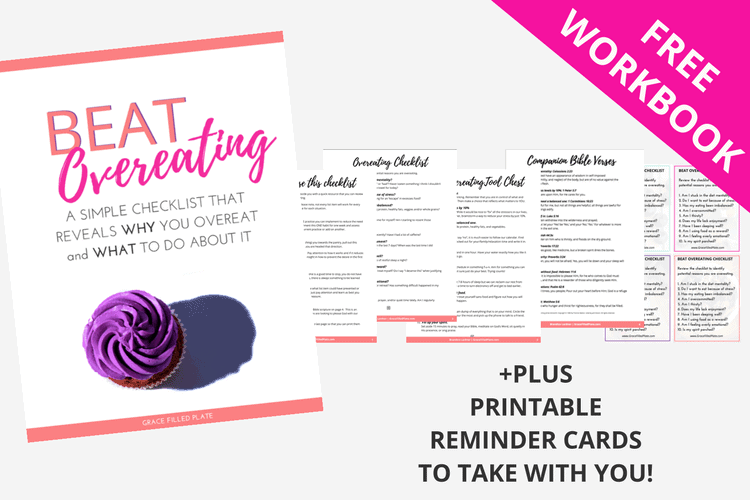 Download your FREE Beat Overeating Checklist Printable below! Your printable packet includes 10 simple solutions to these 10 challenges that you can start using TODAY! Learn more about how to Beat Overeating here. Enter your name and email address below and I’ll send your Beat Overeating free downloadable PDF right away. You’ll also receive several emails from me detailing my personal and coaching experience in overcoming overeating (and you can unsubscribe with one-click anytime). Don’t miss it! This post came at a great time! The past few days have been a whirlwind of food and celebration (My church small group, dinner with my father-in-law, our anniversary), and lots of overeating. Luckily, I think I’m no longer affected by guilt; but I keep asking myself why I can’t stop overeating! Quite a few of the reasons above apply to me, but the two that stick out most are my monthly hormone junk and rewarding myself with food. It’s just natural for me to reach for extra chocolate on those rough days! I grabbed your checklist and am gonna read it over carefully. =) Thank you! Thank you so much for your commitment and your desire to help people like me in their struggles! Since six years I’m in a constant battle with my body: anorexia, overexercising, binge-eating, gaining weight, eating healthy, overeating.. I’ve done it all and always tried to gain control over my eating behaviour but as the years passed I just realised that I can’t do it on my own. The only one who can help me out is god and I believe that he will, as he showed me your website and let your words speak into my heart. In my weakness his strength can be shown. I am really thankful to be inspired knowing what to overthink while praying for mental health and strength. Thank you!!! Hi Nelly! Our stories sound quite similar. I too tried to “fix” my food issues on my own and only seemed to dig my hole deeper and deeper. I think it was because I couldn’t see how to practically include God in my “food fight.” Turns out it was more simple than I thought– prayerfully ask the Holy Spirit to show you ONE thing to work on this week. THEN, do that ONE thing unto the Lord. Pray for help, praise Him when He show up, and shut that fridge door or eat that meal you want to skip UNTO HIM. That’s really the “secret sauce” 🙂 I’m glad you here and am always here to listen!